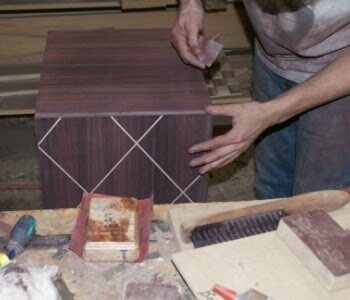 When it comes to wood finishing the most critical part of the process is sanding and preparation. Doing this properly requires a great deal of care and patience, but seeing the end results makes the added effort totally worthwhile. 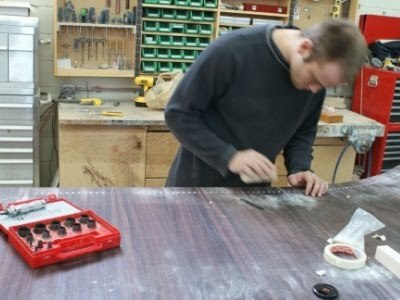 At various stages in the previous posts it was apparent that a great deal of sanding work was already being done during the actual woodwork. The desk top in particular required considerable filing and sanding while fitting the mother-of-pearl. 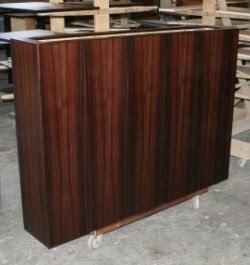 Since East Indian Rosewood is a naturally oily wood, it is necessary to wet and brush the pores to remove excess build ups. Once the wood has thoroughly dried the fine sanding work can begin. 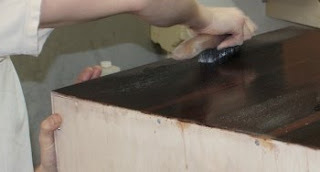 Starting with 120 grit sandpaper, the sanding progresses through ever finer stages until a 240 is used to remove marks left by the coarser papers. 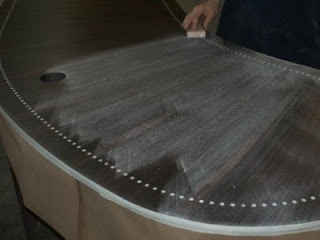 320 grit sandpaper is used between coats to progressively smooth the finish. 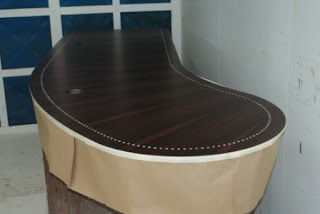 This is a view of the finished desk top. 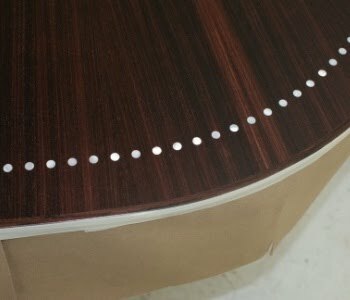 A detail view of the desk top showing mother-of-pearl inlays. This is the main exterior shell of the pop-up cabinet. 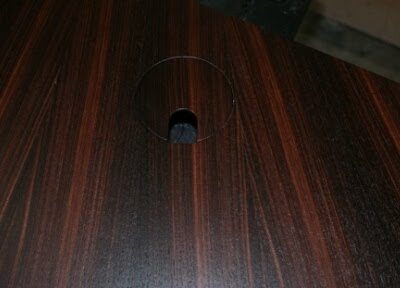 Check out the faux ivory inlays on the split shell of the Scotch Bar. 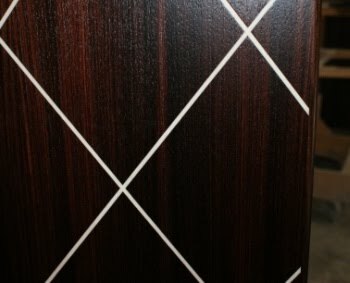 These inlays literally "pop" in contrast with the Rosewood. 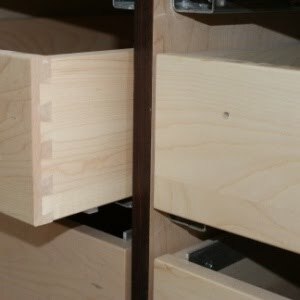 A detail view of the dovetailed drawer boxes. This is the credenza top, showing one of the inlaid custom wood grommets we made. 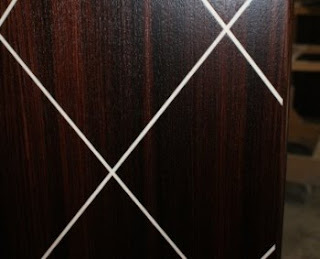 I challenged Kevin to find a piece of Rosewood that would match up with the pattern of the top, and then to cut it in such a way that it would align as closely as possible with the existing grain. As you can see: he nailed it (figuratively). The base of the Scotch Bar will take a little longer to complete, since multiple applications of vinegar and iron solution are needed to sufficiently darken the wood. 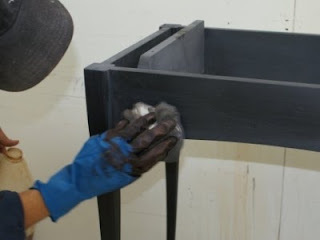 This mixture is one of the traditional ways of ebonizing wood, and time must be allowed for the wood to progressively darken. Labels: Bee's Wax, Finishing, JLT, Kevin Wiggers, Linseed Oil, Scotch Bar, Tung Oil, Wiggers Custom Furniture Ltd.